The Ladies Gaelic Football Association is an organisation which endeavours to reach into communities in Ireland and internationally to promote Ladies Gaelic Football. Voluntary workers and employees throughout Ireland and internationally promote the ideals of the Association and assist other organisations with like ideals. We, in the LGFA rightly believe our game to be among the finest in the world but we know too that the LGFA is about more than just what happens on the field of play. Indeed our game can only continue to flourish if we strive to apply the same high standards to everything that we do behind the scenes as well. We should pride ourselves not just on what we do, but on doing things the right way. We, in turn as an association, have a responsibility to those volunteers to ensure that they are aware of the standards expected of them, and have a well-defined structure within which to perform their duties, and upon which they can rely. 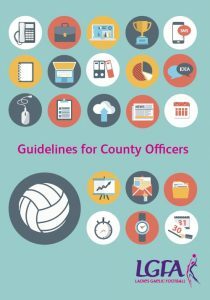 This guide will serve as a useful reference point for officers as they continue their invaluable work, and offer support and guidance to all our officers and volunteers throughout Ireland and internationally.